Like the desktop version of Evernote ( ) I recently reviewed, Evernote for the iPhone is a tool for capturing and viewing data stored on your account at evernote.com. An Evernote account is required to use the application and there are two account flavors; free and somewhat limited, and paid with more features for $5 per month or $45 per year. While paid accounts offer some interesting extras, free will work for most users, especially at first. Every Move You Make: Evernote uses your iPhone’s built in GPS to track where you were when you captured a note. The Evernote app lets you capture four types of notes: Text, snapshots that you take with your iPhone’s camera, photos already on your camera, and voice notes that you record from within the Evernote application. Evernote can’t import audio notes you’ve created using the iPhone’s built-in voice recorder, nor can it import video that you’ve recorded using the 3Gs’ built-in video camera. Evernote has been unclear on when or if these capabilities will be available. Notes you create on your phone upload to evernote.com in a snap as long as you’re on a Wi-Fi or 3G network, but those in AT&T’s outer limits or still using first-generation iPhones will enjoy less than spectacular upload and retrieval speeds. In fact, when I originally looked at Evernote on the EDGE network, syncing was so slow that I only used the program when I absolutely had to. Evernote’s search tools are snappy and they highlight what, for me, is one of Evernote’s most intriguing features: its ability to recognize text found in images you’ve uploaded. Take a picture of a document or a prescription label, or upload a screenshot or even a photo you’ve taken of someone with text on their t-shirt, and within seconds of being uploaded to Evernote’s servers, a search will locate images based on the text they contain. But I was disappointed to find that, while the app is GPS-aware and stores location data for everything you capture, I was unable to search for anything based on the location that I uploaded. There is a workaround for this, as the latest version of the Evernote app allows you to filter and sort notes based based on six criteria, including city and country, but I’d also like to have the option to type “San Francisco” in the search field and see every note I captured in San Francisco. What’s missing from the Evernote app that I’d really like to see added is the document-editing capabilities available on the Evernote Web site and in the desktop app when you have a paid account. Editing on the iPhone is only possible with plain text notes. Otherwise, if your document has stylized text, embedded images, or other special formatting, you can only append a text note to the end of an existing document. While there are some limitations in the Evernote app that I’d like to see resolved, especially when it comes to video and audio recorded with your phone and document-editing capabilities, overall I found this app to be a great addition to Evernote’s stable of note capturing tools. 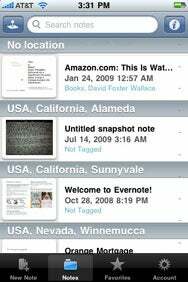 Evernote is compatible with any iPhone or iPod touch running the iPhone 2.2 software update.